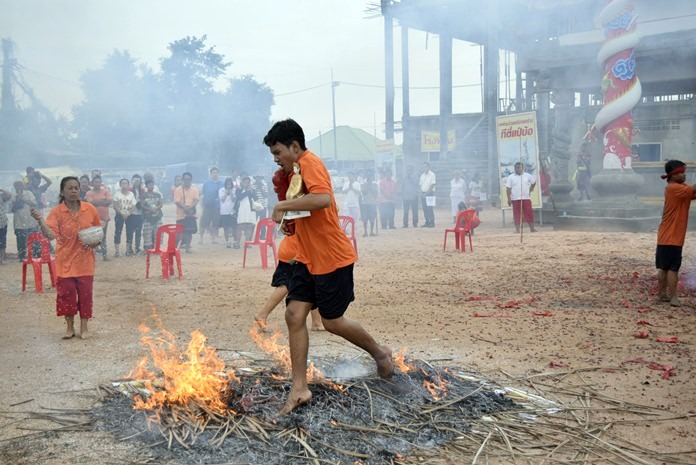 A devotee walks barefoot over a bed of hot embers as he carries an image of Chao Mae Lim Kor Niew during the annual festival to honor the goddess of fire and water. It is believed that the ritual purifies the participants, proves their faith and fulfills their vows and helps ward off evil spirits while praying for luck and good fortune. Scholarships and food for the poor were donated at the annual Chao Mae Lim Kor Niew goddess festival. 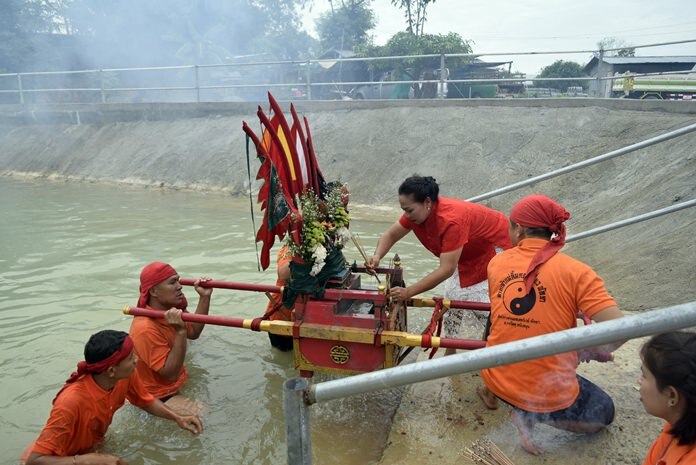 Nongprue Deputy Mayor Anak Pattanangam presided over the April 29 finale of the four-day festival at Chao Mae Lim Kor Niew shrine at its new location just off Highway 7. 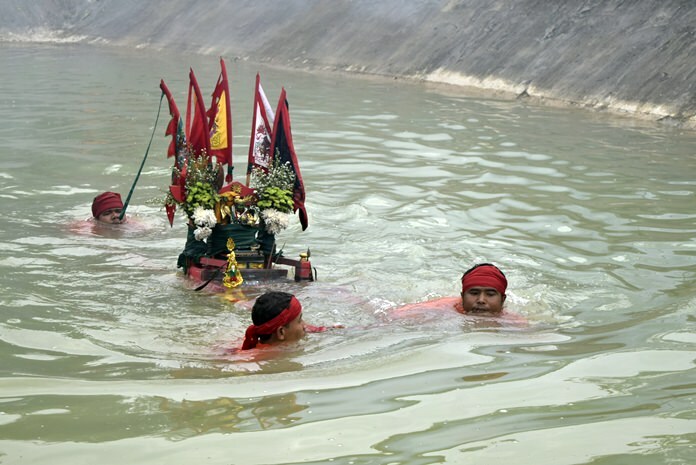 Devotees perform the ritual of bearing the image of Mae Lim Kor Niew through deep water. 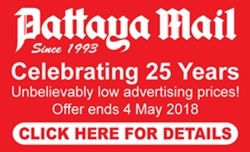 The Saengtham Sattha Pattaya Foundation organizes the festival every year to make merit and ask for prosperity from the fire-and-water goddess. The group was established by Laksamin Wanset to support charity efforts and organizations. It is aimed at believers of the Lim Kor Niew Pattani goddess to help those in trouble and support non-political community activities. 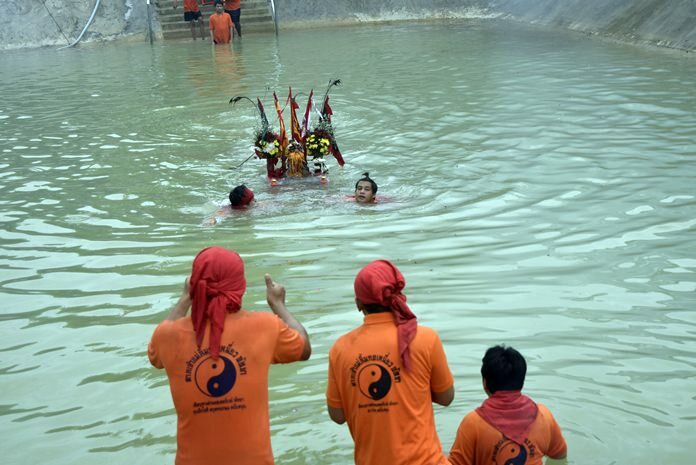 Rituals include entranced mediums carrying the Goddess’ image over flaming embers and through deep water. This year the group handed out 29 scholarships to local students and 388 bags of rice for the poor. The Lim Kor Niew Goddess traces its origins to the southern Thailand province of Pattani between 400 and 500 years ago. It is believed a woman from the Chinese city of Kokkien came to Thailand to find her brother, Lim To Khiam and bring him home. However, when she found him she discovered he had married the Pattani governor’s daughter and converted to Islam. She then committed suicide as she had pledged that if she could not bring her brother back, she’d rather die. The brother buried her in the Gruesae Village cemetery outside Pattani City and her soul is said to have supernatural powers. People visited the grave to receive good luck and thus the legend spread.